We start 2016 with 7 exciting new Our Story titles. The people that you will read about in these stories could not have imagined the changes that would take place in Southern Africa. 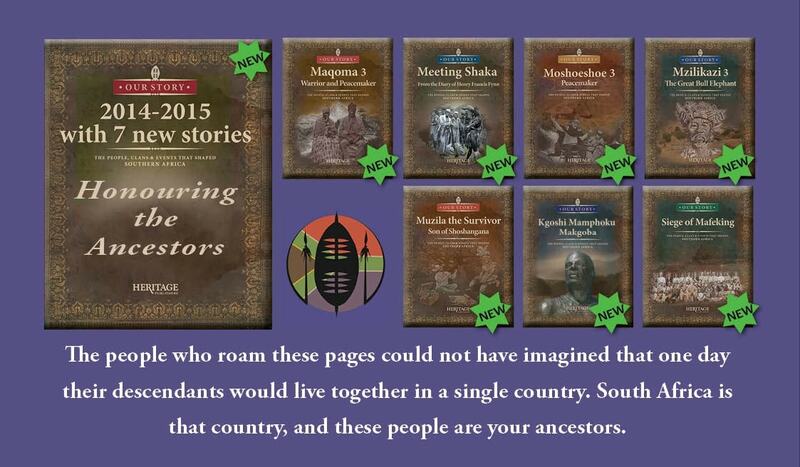 Read how your ancestors were part of shaping South Africa and the peoples that we know today. In the final of a three-part story, read about Maqoma’s attempts to prevent the colonial patrol system from returning to Xhosaland. From the rule of Sandile, the War of the Axe and the War of Mlanjeni, to incarceration on Robben Island, Maqoma played an important role in relationships with the powerful Cape Colony. A bored eighteen-year-old Londoner seeking adventure, discovers the real Shaka behind the myth and legend. Seen through the eyes of an outsider, Fynn’s diary gives us a fascinating account of the life, culture, tradition and customs of the Zulu at the time. Befriended by Shaka, Fynn also gives us insights on the most powerful King in Africa. In the final of our three-part story, the aging Moshoeshoe begins to lose control of his headstrong sons and chiefs. Old for those times, Moshoeshoe did his best for his people by seeking protection from the British Queen. Read about the remarkable life and reign of Moshoeshoe, one of Africa’s legendary leaders. Book 3 (in a 4-part series) tells how Mzilikazi continues on his Great Path through the vast plains of northern South Africa, clashing with Sotho clans along the way. From encounters with Bergenaars, British and Afrikaans pioneers, Mzilikazi makes his mark as he travels across the land. This book tells of Muzila, the son of Shoshangana and the father of Nghunghunyani. Read how Muzila, a shrewd politician, steered his multi-cultural and multi-ethnic kingdom through rapidly changing times. Kgoshi Makgoba of the BaTlou was one of the chiefs who stood up against what he thought was not right. This story tells of a rebellion against the laws introduced by the South African Republic, of a war and its tragic – and gruesome – consequences. This is the story of the siege from the perspective of the people involved: the British, Boer and Barolong. More than a ‘white man’s war’, read about Sol Plaatje, Colonel Robert Baden-Powell, Mathakong and the struggles of ordinary men and women caught up in that tumultuous time. This entry was posted in News Feed, Our Story Collection. Bookmark the permalink. As a language practitioner in the Sesotho language, I would appreciate a list of any and all of your Sesotho Plublications. I would like to purchase a copy of the Titles in the Our Story Series.